Drawn from a copy made after a plan owned by Mr F. Macklen, which he received from Mr [John] Chisholm in 1794. The original map, attributed to S. H. Ghent, is in the McMaster University Library Special Collections. Copies are held in the Map Room of the Geography Department, McMaster University. For a copy of an earlier version of the plan, see the Detail image. 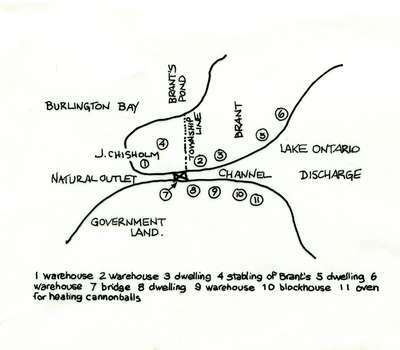 This plan shows "E[ast] Flamboro" and "Nelson or Halton", but the township line is not named. "N. Wilson" is named as a landowner in East Flamborough. Redrawn by Alan G. Hall, ca 1988. Al Hall (1923 - 2008) and his wife Hazel were active volunteers with the BHS after his retirement. He served as Surveyor for the City of Burlington from 1964 to 1987. Thanks to Paul Huntington for his comment pointing out that the blockhouse (10) was not constructed until 1814.